It's hard to imagine any surface that wouldn't look better clad in HARRIS TWEED. If atmospheric temperatures didn't exceed 3000 degrees Fahrenheit upon reentry, we're pretty sure NASA shuttles might make their orders. In the HARRIS TWEED Button Up, one iconic fabric meets an innovative design. The result: super warm, and resilient. Can't get over this hat! Stylish, comfortable and warm - they don't call Chicago 'The Windy City' for nothing - and this pretty hat stays on and keep me warm and dry! Awesome work Stormy Kromer! I really like the stylish look of this cap in Lowell. But, it is too small and I ordered the same size as my Petal Pusher. I have a fairly large head and I'm disappointed that I ordered the largest size and will need to return it. Sandy - Please contact our Customer Service department. We may be able to help. I bought this cap for my wife. This is our family's second Kromer, both seem to run small despite following the measuring instructions on the site. Wife came up in between sizes so we ordered the next size up; still just a bit too small. We returned for one more size larger and she loves it. I had a similar experience with my Original but after getting it right I recently bought another cap and vest. 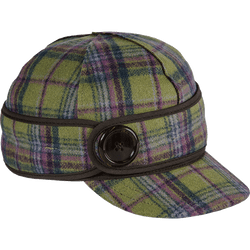 With now three Kromer caps in the stables plus some clothing and accessories we're ready for whatever ole man winter can throw at us. Fir is as expected, I love my Stormy ! 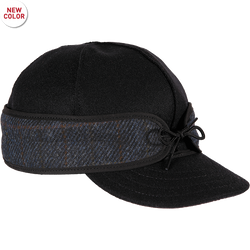 Purchased my first Stormy Harris Tweed Button cap for myself recently as Syracuse NY gets VERY cold at times during the winter. This cap is adorable! I've worn it almost non-stop since receiving it and have received several compliments on it, including from my husband! The ear band doesn't quite cover the entire ear, but I would suspect that this will almost always be the case. 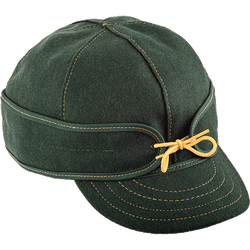 I am looking at ordering a second cap. Couldn't be happier. I love this hat! It's warm and the Harris Tweed is beautiful!! The ear warmer works well for me - covers most of my ears and is just tight enough to keep wind out (but not be uncomfortable). Bought the cap and purse in brown,love them both! Bought the hat and purse in the brown. Absolutely wonderful. Love SK. Can't stop buying it. Linda W., St. Clair Shores, MI.